This book develops and applies a new approach to the study of the working group and indeed of productive enterprises more generally. Unlike similar studies, in this volume the human is related back to the technological, and it is the socio-technical system as a whole that is the object of study. 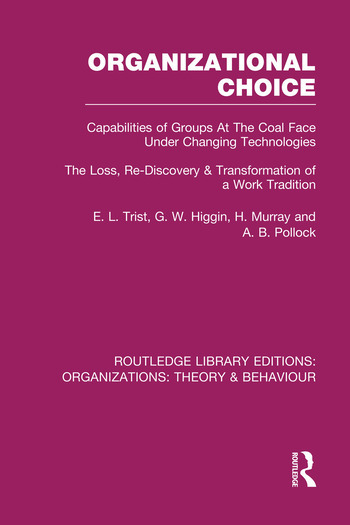 The work reported in this book shows how alternative modes of work organization can exist for the same technology, giving the possibility of organizational choice. Introduction. Part 1: Pattern and Process. Section 1: The nature of the Project: Methods and Concepts. 1. The Socio-Technical Approach. 2. Design and Methods. 3. The Appraisal of Socio-Technical Systems in Mining. Section 2: Traditional and Conventional Work Group Organization. 4. The Single Place Tradition. 5. Conventional Longwall Working: Its Emergence and Variants. 6. The Situation and Characteristics of Single Task Groups. 7. The Displacement of Operational Control. Section 3: Emerging Forms of Work Group Organization. 8. The Emergence of Composite Longwall Working. 9. The Nature of Composite Self-Regulation. 10. The system Effects of Higher Mechanization. 11. Organization and Manning under Full Mechanization. Part 2: Comparative Studies and Field Experiments. Section 4: Comparative Studies of Performance and Control. 12. Evaluation of System Functioning. 13. Face Team Organization and Maintaining Production. 14. Work Load Stress and Cycle Regulation. Section 5: The Creativeness of Composite Work Groups. 15. Origin and formation of Two Composite Teams. 16. Contrasting Patterns of Initial Deployment. 17. The Appearance of Independent Developments. 18. Convergence Through Mutual Learning. Section 6: The Interaction of Management, Trade Union Lodge, and Working Group in a New Situation. 19. Initial Failure. 20. A Second Attempt Gets Into Difficulties. 21. Crisis and Resolution. 22. Underlying Forces and Group Defences – An Analytical Commentary. Section 7: Change Processes. 23. Organizational and Technological Change. 24. Change Within Conventional Longwall Technology. 25. Changing from Conventional to Composite Working: The Process. 26. Changing from Conventional to Composite Working: The Results. Section 8: Preparing For Higher Mechanization. 27. The Need for a Machine-Centred Work Culture. 28. Mechanization in a Manual Context. 29. The Selection and Training of Face Teams. 30. The Development of Adaptive Work Organization. Summary and Conclusions. Appendices. Bibliography.